Channel Sample: 5.48% zinc & 1.08% lead over 1 meter (Line 4W Trench). 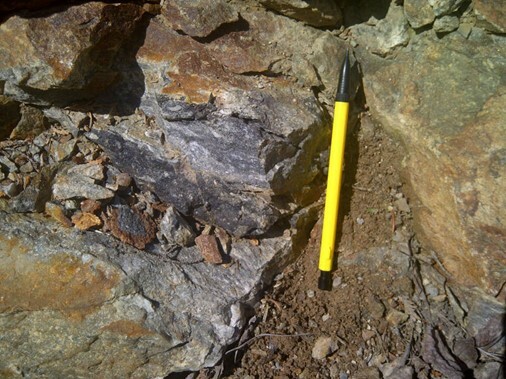 Boulder Sample: 20.7% lead, 6.89% zinc and 122 G/T silver (Line 3W Trench). Multi-element soil geochemical anomalies in central and southern regions. Induced polarization (IP) geophysical anomalies in central and southern regions. The 2018 diamond drilling program tested under a mineralized exposer in a 2012 trench (Line 4W Trench). A one meter channel sample collected from this exposure in 2012 was reported to return 5.48% zinc and 1.08% lead. A qualified person has not verified this data as the sample location is no longer evident in the trench. A qualified person has verified lead, zinc and copper sulfide mineralization in stringers / veins within this approximately 25m long east-west trending trench. 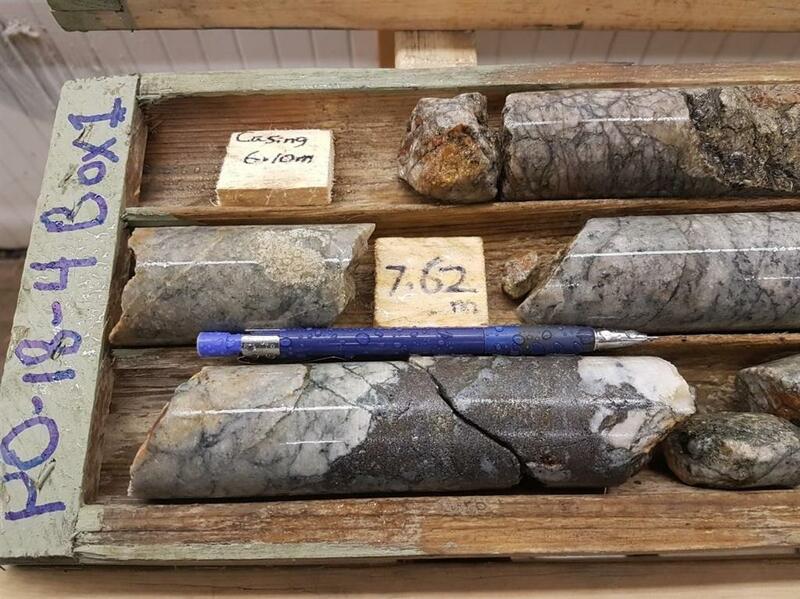 A boulder sample collected during 2012 in an adjacent trench (Line 3W Trench) was reported to return 20.7% lead, 6.89% zinc, 2.04% copper and 122 grams / tonne (g/t) silver. A qualified person has not verified these boulders / data as this trench has been reclaimed. The 2012 trenching was conducted by Great Atlantic in an area of base metal geochemical anomalies and IP geophysical anomalies. Each of the 2018 diamond drill holes intersected local, near-surface base metal sulfide mineralization, occurring as disseminations in host rock and in veinlets / veins. Drill core samples are currently being cut for multi-element analysis. 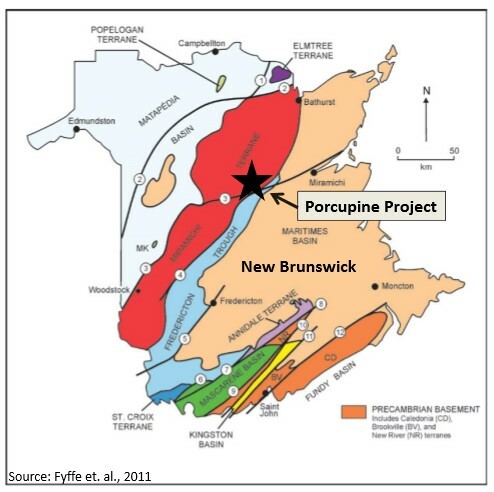 The Porcupine Property occurs within the Miramichi terrane which trends northeast-southwest through New Brunswick. The Miramichi terrane hosts numerous volcanogenic massive sulfide deposits in northeast New Brunswick in the famous Bathurst Camp. Many of these deposits were mined, including the historic Heath Steele Mine, located approximately 40 kilometers northeast of the Porcupine Property. Volcanic rocks are reported locally within the Porcupine Property. The Porcupine Property is located approximately 50 kilometers west of the city of Miramichi. Access is excellent with logging roads transecting the property. The property currently covers an area of approximately 2,830 hectares. David Martin, P.Geo., a Qualified Person as defined by NI 43-101, is responsible for the technical information contained in this News Release. Mr. Martin is a consultant for Fort St. James Nickel Corp. and VP Exploration for Great Atlantic Resources Corp.
Mr. Christopher R. Anderson " Always be positive, strive for solutions, and never give up "
About Great Atlantic Resources Corp.: Great Atlantic Resources Corp. is a Canadian exploration company focused on the discovery and development of mineral assets in the resource-rich and sovereign risk-free realm of Atlantic Canada, one of the number one mining regions of the world. 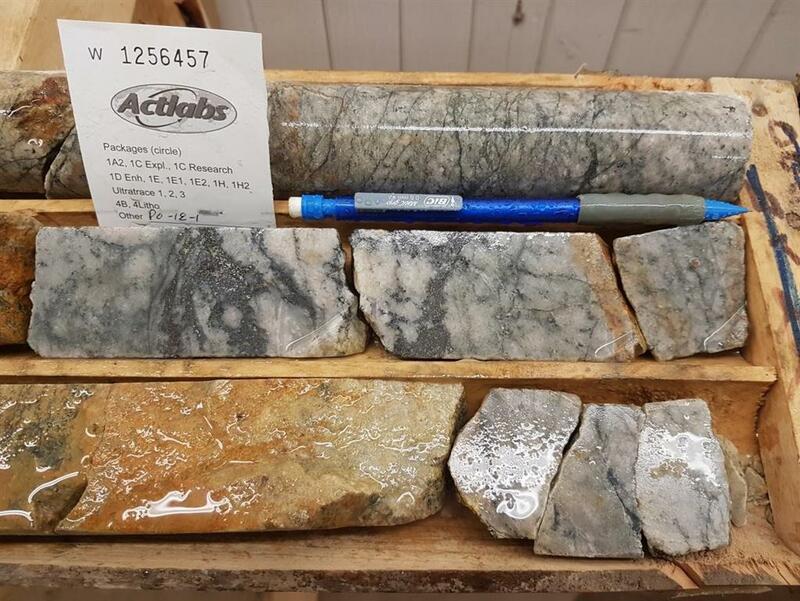 Great Atlantic is currently surging forward building the company utilizing a Project Generation model, with a special focus on the most critical elements on the planet that are prominent in Atlantic Canada, Antimony, Tungsten and Gold. This press release includes certain statements that may be deemed "forward-looking statements". All statements in this release, other than statements of historical facts, that address future exploration drilling, exploration activities and events or developments that the Company expects, are forward looking statements. Although the Company believes the expectations expressed in such forward-looking statements are based on reasonable assumptions, such statements are not guarantees of future performance and actual results or developments may differ materially from those in forward-looking statements. Factors that could cause actual results to differ materially from those in forward-looking statements include exploitation and exploration successes, continued availability of financing, and general economic, market or business conditions. SOURCE: Great Atlantic Resources Corp.